Iona Rozeal Brown remixes and recreates art history to examine colliding cultures. Her work refers both to the Western fascination with Asian pop culture and Ganguro, a 1990s Japanese movement in which young girls expressed their love of hip-hop culture by darkening their skin. 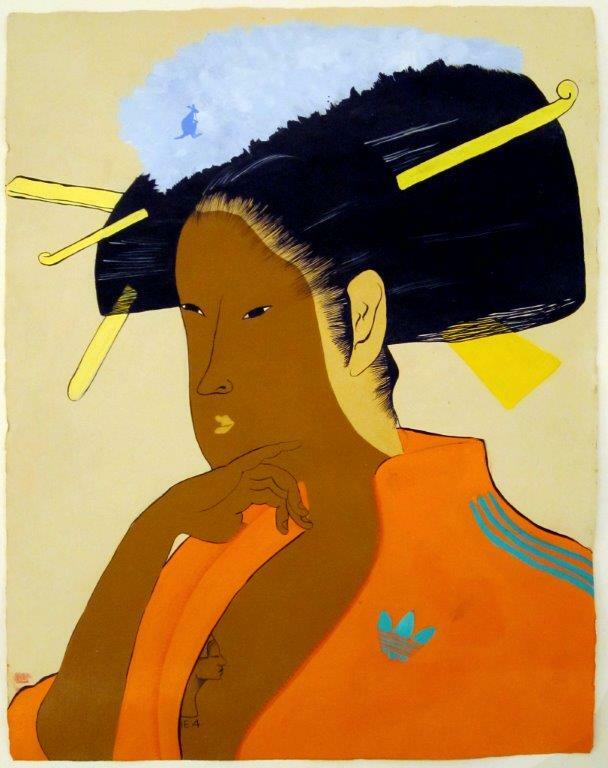 The title a3 stands for afro-asiatic allegory, Brown’s abbreviated reference to her hybrid creations and cultural appropriation as an African American artist assuming the identity of an Asian artist. This painting imitates the ukiyo-e (Buddhist term used in Japanese art to reference luxury) style of 17th-18th century Japanese prints. She then mixes it up by reversing their traditional whiteface makeup to blackface and incorporating contemporary hip-hop trappings—KANGOL headwear, Addidas jacket, and a tattoo—to examine a dual-edged cultural appropriation. Brown currently lives and works in Brooklyn. Her work is part of numerous collections across the country including: The Studio Museum in Harlem, New York; Wadsworth Atheneum, Hartford; Norton Family Collection, Santa Monica; The New Museum, New York; Yale University, New Haven; Milwaukee Art Museum; Rubell Family Collection, Maimi, Miami; and Hirshorn Museum and Sculpture Garden, Washington D.C.